EtherRain Controllers, rain sensors, and supporting products are currently available for sale direct from QuickSmart. Products can be shipped to both domestic US and international locations. EtherRain controllers purchased directly from QuickSmart are covered by a six month limited warranty and a 21 day trial period is included within our standard purchasing terms. 1. Contact QuickSmart with your purchase request. Please use our email contact form to ensure that your request reaches us. Please include your ship-to state (and country if outside the US) so we can accurately quote shipping. 2. We will respond with sales terms and a price and delivery quote. 3. After you review our quote (confirming price and terms) please send us your quote approval via email. 4. Upon receiving your approval, we will prepare a PayPal electronic invoice and PayPal will send the invoice to you. You may pay the invoice at your convenience up to the expiration date of the quote. 5. Upon PayPal OK to ship, we will ship within the leadtime quoted, generally 1 business day. PayPal Electronic Invoicing accepts all major credit cards and a PayPal account is not required. All credit card processing is handled securely through PayPal. 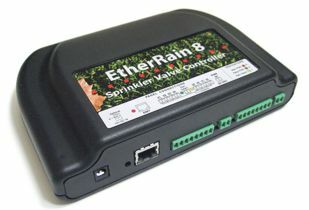 EtherRain controllers, EtherRain rain sensors, and Switch modules are manufactured in the United States. Inquiries for the retail sale, distribution, or integration of EtherRain Family Products are invited. As we establish a credible sales channel we will provide links on this page to our channel partners for purchase fulfillment and will recommend purchase through our channel.